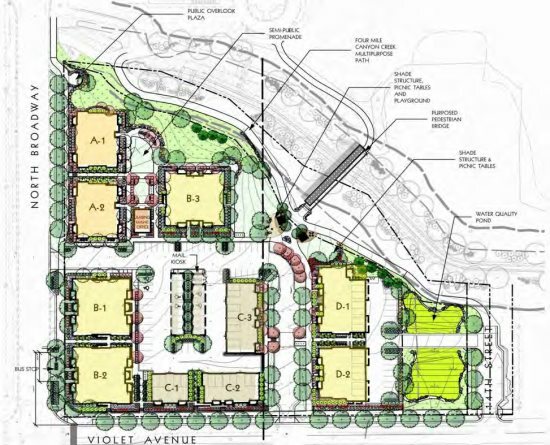 At a PLAN-Boulder County forum on Friday, June 28, Terry Palmos, Vice President of Palmos Development Company, described the “Violet Crossing” project that his company will soon start building on four and a half acres in north Boulder. 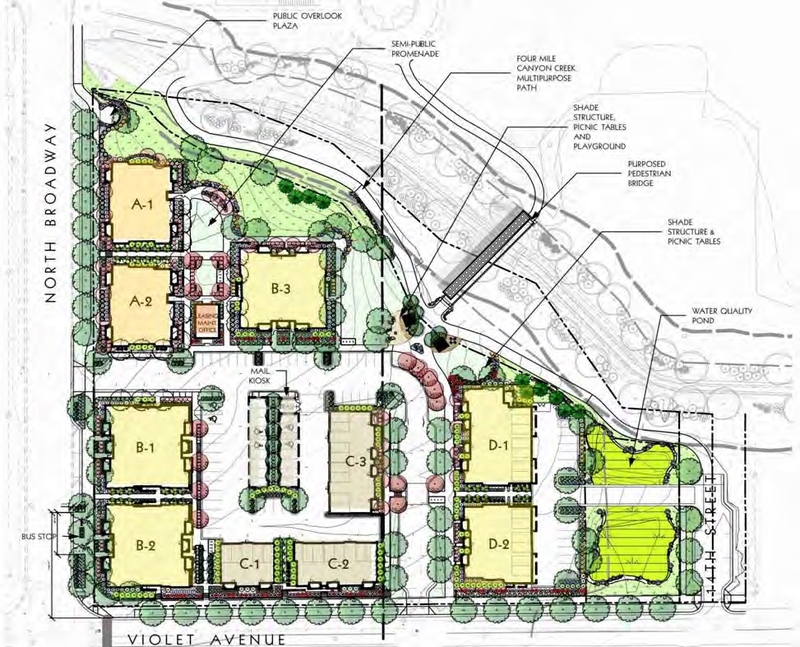 Palmos said that Violet Crossing will contain 98 rental apartment units clustered in eleven separate buildings at the corner of Broadway and Violet. Two of the buildings along north Broadway will be three-stories high, and the rest in the project will be two stories. The roofs will be flat. The buildings along north Broadway and along Violet will be located immediately adjacent to the sidewalk. Each building will vary somewhat in appearance from every other one, but they are generally designed to be visually compatible with most of the other new construction on the east side of north Broadway. The buildings will be clad in brick, stucco, and wood or imitation wood siding. The designer is OZ Architecture, a major Colorado firm. The project will offer no commercial space, nor will it contain a swimming pool, gym, lounge, tennis court or other amenities often found in apartment complexes. Palmos asserted that his firm’s research found that prospective tenants are generally not interested in such features. He said that the units are carefully designed for efficiency and generally occupy 20-25 percent less floor area than comparable apartments in the Boulder area. Sixty percent of the apartments will have two bedrooms and forty percent one bedroom. Palmos declared that Violet Crossing will be abundantly landscaped with trees and flowering plants. Palmos claimed that construction will start this month and continue for about a year. Palmos reported that the project’s neighbors had vehemently opposed any attempt to reduce the number of required automobile parking spaces out of fear that its tenants would park on adjacent streets. He said that parking spaces will be located in the interior of Violet Crossing, with most in carports or tucked under buildings. Sixty-six covered bicycle parking spaces will be provided. Palmos said that his firm will build an improved bus stop at Broadway and Violet. 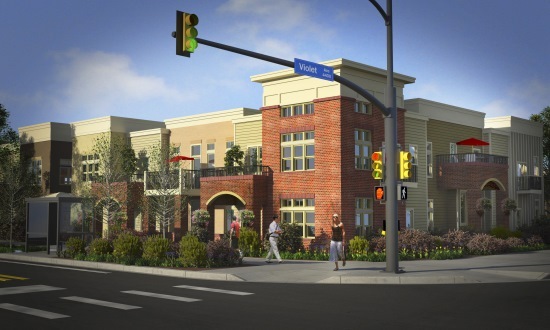 On-street parking will be allowed in front of Violet Crossing on north Broadway, Palmos said. Several audience members indicated that they thought such parking would help encourage pedestrians to use the sidewalk. Morzel commented that she would like to have traffic circles installed at Broadway and Violet and Broadway and Yarmouth. Audience member Carolyn Dulchinos chided the Palmos Development Company for depositing what she called “mounds of debris” from Violet Crossing on property that it owns at 28th Street and Jay Road. She said that the piles of material violated Boulder County grading regulations. Palmos responded that his company had originally expected that the material would be moved back to Violet Crossing in about a month, but that the start of construction had been delayed for about a year and the transfer of the stuff to a third site in eastern Boulder County or Weld County would have been a waste of energy and money. He promised that the material would soon be restored to Violet Crossing and seemed to imply that the Boulder County zoning staff had tacitly acceded to the delay in complying with the grading regulations. Palmos and Morzel asserted that the property opposite Violet Crossing on the west side of north Broadway is expected to be redeveloped with a mixture of commercial and residential space.